How much solar do I need to power an Electric Vehicle? I don’t understand MPGe. A better metric would get me closer to knowing what I really want to know; how much does it electricity does it take to charge my car’s batteries? How far will that get me? What does it cost? How much solar do I need to offset the power consumption of an EV? We’ve been driving our 2013 Nissan Leaf for one and a half years now and I have some data… the metric that makes the most sense to me is miles/Kwh. We live in a climate that is less than perfect for electric cars; little too hot in the summer, little too cold in the winter and lots of mountains. But still we average 4.5 miles/Kwh annually. I can’t find much difference in efficiency between the different makes and models of EVs. It seems to have much more to do with your climate, geography, topography, and a driver’s tendency to show passengers how fast an electric car will take off from a start. In 2016 we drove 12,108 miles. Assuming 4.5 miles/Kwh, then 2,691 Kwh went into powering the car. Our solar array is officially rated at 3,240 watts. It was predicted to make us 4,753 Kwh annually, but in 2016 it gave us only 4,000 Kwh (16% less than estimated). The solar guys say this is because their software doesn’t de-rate for “losses” like; snow on the panels, age, azimuth and orientation. Sounds like a weak excuse to me; regardless, 4,000 Kwh is what we get. The solar panels made enough power to push the car 4,000 x 4.5 = 18,000 miles. Each one of our twelve panels made us 1,500 miles worth of driving electricity. We drove only 12,108 miles, so the rest went into powering the house. To zero-out our total electric consumption, we would need to make a total of about 8,000 Kwh of power, or have a 6,500 system. 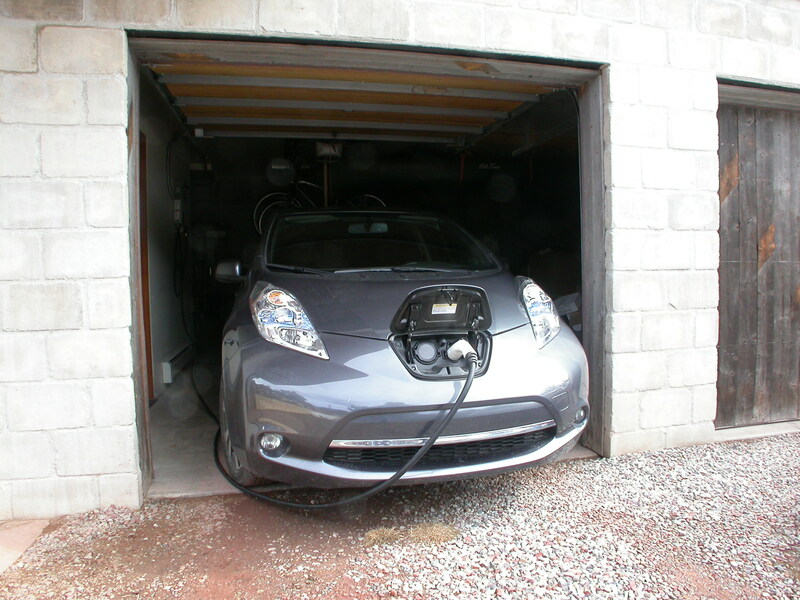 2,700 Kwh for our 12,000 miles of driving (34%) and 5400 Kwh for the house (66%). So, how much solar do you need to offset your drive. Impossible to calculate for sure, but here’s starting point… wattage of PV array required = (miles driven annually / 4.5 miles/Kwh) X .8 If you have a lead foot, get a couple more panels. If we bought the electricity to drive the car 12,108 miles (2,691 Kwh x $.138) it would have cost $371. It would cost me about $1,000 for the gas to drive our 2005 Subaru Outback the same distance. Solar is good when offset your home electric uses, but when it keeps you from buying gas- it pays back three times faster! And don’t get me started on maintenance and repairs; oil changes, transmission oil, power-steering fluid, fan belts, timing belts, head gaskets, catalytic converters, mufflers, oil filters, air filters, fuel filters, hoses, plugs, tubes, valves, sensors, etc. EV’s still have/need; insurance, tires, shocks, air conditioners, windshield wipers, windshield washer fluid, brakes and brake fluid. But I really don’t miss the regular stops at the gas and oil change stations and repair shops. If you have the means and it fits your commuting- buy one! You’ll love it.